This whimsical dinosaur puzzle is sure to be a hit with any child—and many adults as well! The finished puzzle looks equally nice painted or cut from hardwoods and left natural. The simple lines make it easy for scrollers of any skill level to create custom-crafted gifts for the holiday season. I began scroll sawing puzzles for Christmas gifts after picking up the book Make Your Own Model Dinosaurs by Danny A. Downs. At 3 a.m. on Christmas morning, I was still putting on the finishing touches. I enjoyed crafting the puzzles, but was looking for something less complex. 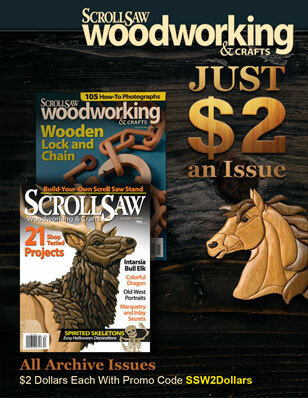 I soon discovered the work of Judy and Dave Peterson in Scroll Saw Woodworking and Crafts. Their puzzles were quite unique and took a lot less time to produce. When a co-worker asked me for a dinosaur puzzle as a gift for her niece, I was excited to design a puzzle in the Peterson’s style. She suggested a “goofy” type of dinosaur, since it was for a younger child. 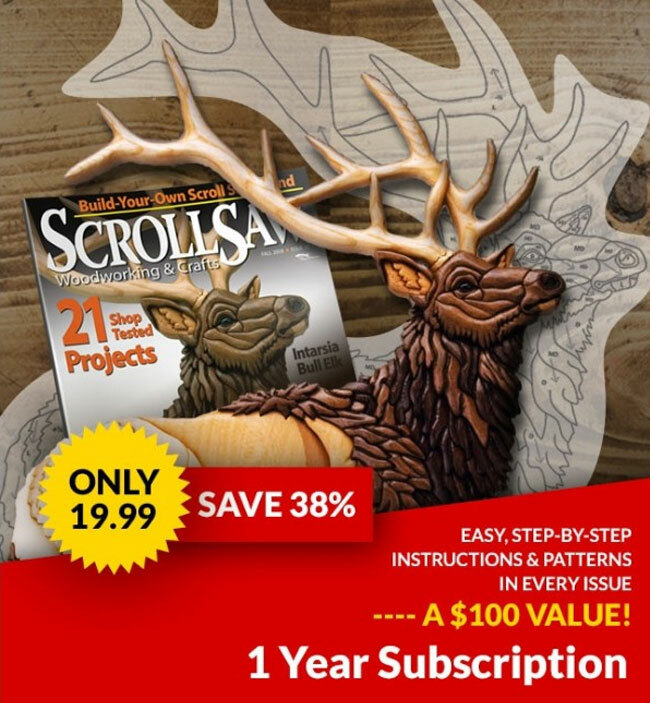 Before cutting a puzzle, make sure your scroll saw table is square to the blade. Otherwise, the puzzle pieces will not pass freely through each other. 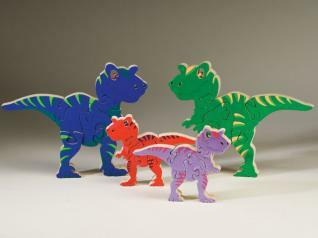 Decide whether you will paint your dinosaur or cut the puzzle from hardwood with an oil finish or stain. Transfer the pattern to the blank. Drill blade-entry holes for the eye and nostrils. These parts are cut first. Cut the line that forms the teeth and smile before cutting the head free. Cut through to the bottom end of the smile line. Then back the blade out, and turn it to make the upper line. Rather than trying to back the blade all the way out, turn off the saw, and remove the blade from the piece. Cut the pieces, then sand each piece and round them over with a flap sander. Decide how much detail you want to add. For a simple paint job, apply the base color to the entire puzzle. I roll the paint over the edges to the point where the rounding ends, that way no wood shows between the pieces when the puzzle is assembled. Then paint the eye, belly, and markings. For a more artistic look, add highlights and shadows with different shades of the base coat. Tint the base color with just a spot of black paint. Apply it in areas to create shadows around the dinosaur’s features. Then add a touch of white to the base color to create highlights. You may need to wash the original base coat color over the shadows and highlights to tone them down. After the paint has been allowed to dry, apply a clear coat to protect the puzzle.